Published on December 3, 2018 in Allenatori, Calcio, Corsa, Generale, Giovani, Tennis and Tiro a volo. 0 Comments Tags: giovani, girls, ISYS, Maureen Weiss, run. Since 2009, Weiss’s most fulfilling work has been with Girls on the Run, a physical activity, positive youth development program designed to enhance girls’ social, emotional, and physical development using running as a vehicle. She attended at ISYS 40th Anniversary and provided some excellent suggestions to young who want to become experts in a specific area of interest. Published on December 24, 2014 in Calcio, Mental coaching and Stress. 0 Comments Tags: calcio-5, emiliano bernardi, futsal, giovani, nazionale. 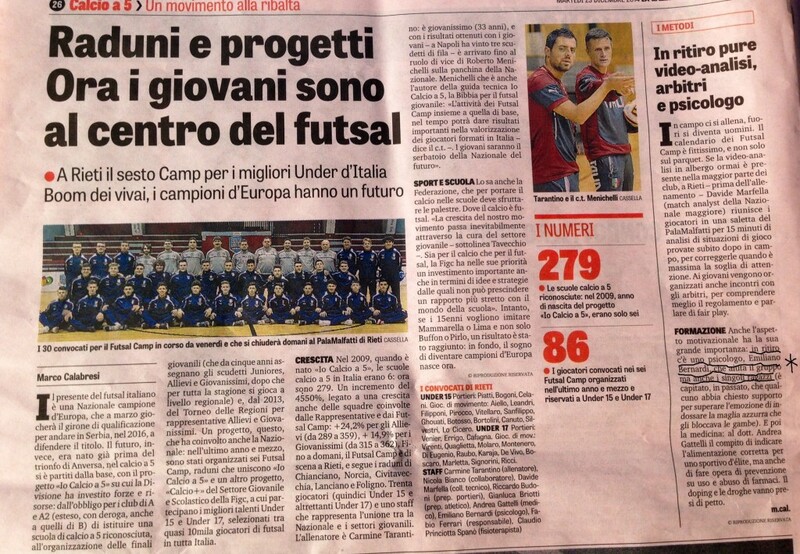 Emiliano Bernardi, sport psychologist working with Cei Consulting, he’s consultant with the Italian youth futsal national team during the camp in Rieti. Published on September 18, 2014 in Allenatori, Calcio, Giovani and Young and Football. 0 Comments Tags: Calcio, giovani, scuole. Some football schools have already opened their sporting year while others will open this week. I hope that more and more clubs have welcomed the sport psychologist in their staff, appreciating the added value provided by a skilled professional. Listening to some of my colleagues I find that often the coaches are the main obstacle to work in a club. They areworried about losing their central role, but often it happens that even if there is the psychologist, the coaches do not know what to ask and how to be helped. I have always believed in the integration of various professionals in every sporting and in particular football schools. Here are interwoven so many different aspects, involving the technical, physical and psychological growth of the young and for this reason, the integration of different professional skills becomes essential. I asked a football expert with whom I worked for many years, to make a list of things you asked me and those who, with his experience of integrated work with the psychologist may suggest to ask . I publish it to share with psychologists and coaches the point of view of a coach who has learned to use the opportunity given by “teamwork”. Italian youth football: from where to restart? Published on July 28, 2014 in Allenatori, Calcio, Giovani, Stress and Young and Football. 0 Comments Tags: allenatori, Calcio, giovani. A few days before the election of the president of the Italian Football Federation (FIGC) many talks are about of youth soccer and how to re-organize it. It’s said to teach the technique before the tactic, it speaks of the importance of the soccer school of the clubs and about coach education too. It’s all right, but the changes must inevitably go through a cultural revolution of youth football that it’s often perceived only in terms of results. In one of the last courses for youth coaches that I conducted, most of the coaches who were there, just to learn how to manage and lead teams of children, would rather not be in front of the youngest categories rowdy and playful, because they had too problems to manage and to learn to win. Most coaches would have liked to have entrusted to himself at least a team of older boys. The explanation was: the opportunity of making an adult football. I remained amazed, because I would expected the desire to grow the players of tomorrow and instead they want boys already grown up. The categories of football school seem to fear, perhaps because the enthusiasm of small noisy children and vibrant can be handled only by competent coaches who are also capable leader, able to transform children into rowdy gamers, who never lose the desire to enjoy it. Every coach wants the winning team and the small champion right away, but no one seems to want to work to build the win. The victory will probably arrive, but who could be the champion of tomorrow will be “burned” already at twelve years, because of the desire to win of an adult who thinks to know everything about football. This is one of the problems of Italian football, definitely a key part that needs new decisions for the future. Published on July 21, 2014 in Giovani, Mental coaching and Young and Football. 0 Comments Tags: bambini, genitori, giovani, resilienza. Ask how” questions rather than “why”. If your child throws their toy train when they are frustrated and it breaks, rather than ask why, ask how he could have responded differently or how can he can help to fix the train. Your child now becomes part of the solution and not the problem. Published on June 16, 2014 in Generale. 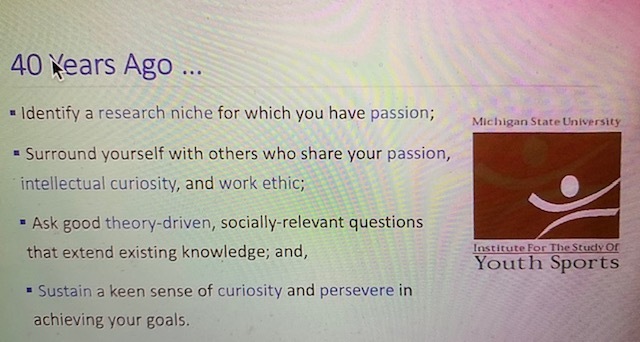 1 Comment Tags: Edutopia, giovani, grinta, inegnare. A new way to teach optimism, Amy Lyon instructs students to become aware of their thoughts through a tool called a “grit pie.” The pie itself represents a student’s obstacle, and each slice represents a realistic cause of the problem. Students analyze whether their thoughts about the problem are permanent (“I stink at math and will never get good at it”) or temporary (“I was distracted by my friends”), and whether they blame themselves (“I didn’t ask for help when I was confused by my math assignment”) or others (“the teacher doesn’t like me”) for the problem. Ideally, students’ thoughts are temporary, and they take at least some personal responsibility for the problem — both of which make positive change much easier. Published on April 23, 2014 in Allenatori, Giovani and Stress. 0 Comments Tags: allenatori, emozioni, giovani. Sport is an activity that tests the skills of young people in managing their emotions. In sports, you win and lose, you make mistakes easily and frequently, and for these reasons it is a situation that calls constantly even self-confidence. It is therefore important for every coach to learn to recognize the emotions of the athletes as a teaching opportunity. The errors they commit as well as new learning and the performances are the optimal situations to train them to handle the disappointment and anger rather than joy. The coach might be aware of the emotions of their athletes, understand the educational opportunities they represent, listen boys and girls with an empathic style, helping them to understand and explain what it happens and seek solutions possible setting the limits within which to find them. Coaches who act in this way they get from their athletes better results than those who behave differently .